Find a vacation home to rent in Kinda Municipality from our list of vacation rental properties. Campaya has over 11 vacation homes available in Kinda Municipality, which give you the possibility to locate a unique accommodation in Kinda Municipality which completes your check-list in search for the perfect self catering vacation apartments in Kinda Municipality or vacation villas in Kinda Municipality. This holiday home standing on a beautiful hill and surrounded by a forest, offers attractions for nature lovers to experience nature close by. This home is in a wonderful location with a beautiful view of the river, located near fishing and swimming lakes. Astrid Lindgren’s World is just half an hour away from here. The river flows here Stångån directly past the cottage. A beautifully landscaped garden with seating for relaxing. In large house is the living room on the upper floor. This spacious accommodation is situated in a beautiful lakeside location. There are good swimming and fishing spots right at your doorstep. A boat is available and is included in the rent. 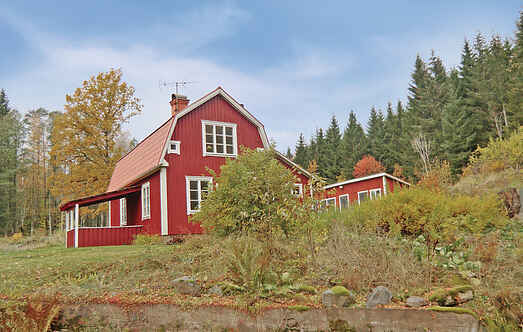 This home is located near the fields and a forest. The forest is ideal to take walks as well as to pick berries and collect mushrooms. Several lakes for fishing are located here. This spacious and beautiful holiday home is located on a farm. The house has a large terrace and a large covered veranda with wonderful views of the mountains and the forest.